America’s mental health crisis has become so dire that life expectancies are declining, even as its ability to combat its historically biggest killers - cancer and heart disease - is improving. Behind life expectancy drops in the last two reported years were increases in the numbers of deaths by suicide and unintentional injury, which includes drug overdose. As World Mental Health Day approaches on 10 October, it’s important to focus on why America faces this macabre possibility. The answer is simple: we treat mental health as separate from physical health, and most definitely not equal in importance. Yet nearly every challenge we face with our over-priced, over-burdened healthcare system exists several times over when it comes to mental health. Neither troubled system can be fixed without attending simultaneously to the other. 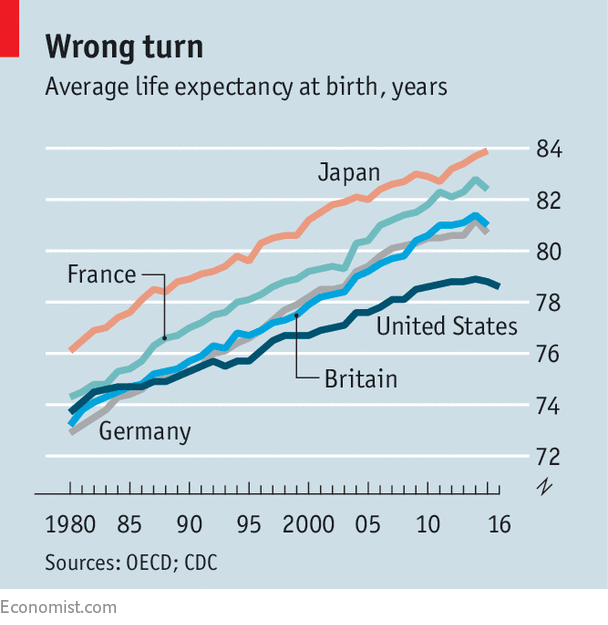 The good news is that if we stop running two healthcare systems - one for physical health and one for mental health - we may be able to reverse the decline in life expectancy and see it rise again. If mental health becomes an integral part of primary care, we can begin to treat mental health issues the same way we do smoking, diabetes and asthma, as conditions that can be prevented and treated through a combination of medical interventions and behavioural changes. Some suggest the solution to the nation’s mental health challenges rests with enlarging the pool of psychiatrists and psychologists. Close to 124 million people - nearly 40% of Americans - live in areas designated by the federal government as having a shortage of mental health professionals. More than 60% of US counties do not have a single psychiatrist within their borders. These statistics have prompted calls for expansions of mental health training by US medical schools, and for programmes that provide incentives for specialists to practice in underserved areas. But the truth is, we can, and need, to go further. A nurse who doggedly follows up about whether a patient got a colonoscopy could be equally persistent about making sure a patient follows through on prescribed counselling. Clinics in local pharmacies could offer “mental fitness check-ups” alongside flu shots. Hospitals could invest as much in peer groups for new mums with post-partum depression as they do in birthing classes and hospital tours for expectant mothers. And doctors could embed cognitive behavioural therapy and physical therapy into their practices as first-line treatments for chronic pain, rather than rely on opioids alone. What is healthy ageing? And how can we achieve it? Here in the US, mobile health monitoring company Livongo has made diabetes care a continual, unobtrusive process by digitally providing patients with real-time data on their condition and offering digital coaching through a simple mobile app, backed by high-quality clinical services. Similar approaches to treating and managing mental health conditions exist. Telehealth providers such as AbleTo and Ginger.io address access challenges with virtual therapy through smartphones, while companies such as Mindstrong Health go a step further, allowing counsellors to reach out to patients on their smartphones based on real-time data. And innovators such as Annum Health offer an alternative to inpatient substance abuse rehab centres through a combination of virtual therapy, coaching and medication treatment. If we’re going to create a truly integrated healthcare system, governments, insurers and employers must create the right incentives. More than 40% of Americans report being lonely, a condition which studies show results in a 30% higher risk of dying in the following seven years. Yet a “loneliness rate” rarely, if ever, shows up on a health system’s dashboard of health outcomes. The Centers for Medicare & Medicaid Services (CMS), which administers Medicare and Medicaid, should link reimbursement for primary care providers to reducing loneliness, just as they tie hospital payments to reducing hospital-acquired infection rates. If CMS did that, health system executives would fast start paying attention to mental health. In 1965, 42% of adults in the US smoked. Today, that figure is 15%. How did we do it? We acknowledged that smoking affected lifespan and we made it a top public health priority. We gave everyone in the system incentives to change, from carrots in the form of new types of insurance discounts and other rewards to sticks in the form of taxes, lawsuits and even new laws that prevent people from smoking in offices and other public places. There’s no reason why a similar full-court press couldn’t reverse mental health conditions that are literally shortening our lives.